Before Bill the Boy Wonder: The Secret Co-Creator of Batman, no telling of the Batman creation story had put Bill (rightfully) at the center. I was left wide open for choice of titles and made a long list starting in 2006. Finger the Boy Wonder—I wish I could have used this instead of Bill the Boy Wonder because the number of syllables is the same as the source phrase, “Robin the Boy Wonder,” plus the word “Finger” is more fun. However, as you surely immediately noticed, this phrase could come across as (wildly) inappropriate so had to be discarded with extreme prejudice. The Father of Batman—Carmine Infantino suggested this, and it became the title of one of the two sections of the Author’s Note. Crusader Without a Cape—Charles Sinclair suggested this. Finger at Bat—I ended up using this phrase in the book. Finger Prints—I used this in the book, too. Bill’s Gimmick Book or The Gimmick Boy—These refer to Bill’s legendary notebooks of story ideas, but they were not specific enough to be the title. Living in a Hiding Place—This comes from one of my favorite songs, “Live in a Hiding Place” by Idlewild. That sorrowful phrase and much of the lyrics could be talking about Bill, but the phrase does not call to mind Batman. The Ghost of Batman—People who worked on comics anonymously were called “ghosts.” But I did not want the title to sound negative. Bill the Man Wonder—Dear lord no. Bat and Bill—A play on “bat and ball.” And an unnecessary one. Bill Finger: Batman's Other Secret Identity—Too literal and I knew this angle would come up in multiple other ways. 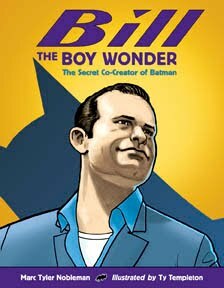 The Secret Identities of Bill Finger: Co-Creator of Batman—I quite like this one. “Secret identity” singular would not stand out with respect to a superhero book because the idea is so prevalent in superhero mythos. However, “secret identities” plural is unusual and therefore grabby. That’s why “multiple secret identities” is the theme of the book. “His Identity Remains Unknown”—It appears in the first paragraph of the Author’s Note. Bill the Wonder Boy (sometimes Bill the Wonderboy)—error. Bat Boys—jest. And cute. But, of course, as noted at top, I’m focusing on just one Bat Boy. 4/8/13 addendum: A similar list for Boys of Steel: The Creators of Superman.